Glazed Redware Teapot and Cover, England, c. 1760, bulbous shape with twig knop and molded crabstock handle and spout, gilded vine and berry sprigging, the pot mounted atop three lion mask and paw feet, ht. 5 1/4 in. Cover: Very slight edge nick and small chip to inner rim. 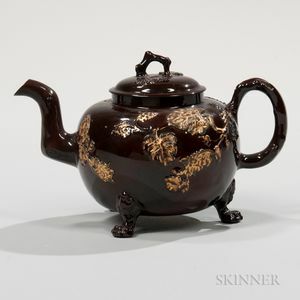 Pot: Very slight edge nicks surrounding top rim; hairlines to both terminals of handle; restored spout and one foot; slight chip to a toe of one foot.